We're always working to improve Skype for Business and are excited to tell you about the latest features that are available now. Skype for Business Online, as part of Office 365, is continually improved. The Skype for Business Help Center is also continually updated with the latest changes. The following are some other resources on what's new. The Update history for Office 365 ProPlus page provides a list of the version and build numbers for each update to Office 365 ProPlus released in the following update channels: Monthly, Semi-Annual (Targeted), and Semi-Annual. Each entry links to the release notes for that release. The Latest updates for versions of Skype for Business that use Windows Installer (MSI) page has information about and downloads for the most recent updates for the perpetual versions of Skype for Business 2016, Skype for Business 2015, and Lync 2013 clients. The Office Blog covers updates to Office 365. Also, read how the updates enable new scenarios for others. The Skype for Business category filters the Office Blog to posts about Skype for Business only. The Office 365 Roadmap is the official site for Office 365 updates and changes. In addition to listing updates available now, the roadmap also includes information about improvements that are coming soon. Search for Skype for Business to filter the roadmap. Administrators and IT professionals should read Stay on top of Office 365 changes, which covers update messages delivered through the Microsoft 365 admin center. When in a meeting, you can share documents as attachments by clicking More Options (…) and selecting Add Attachments. 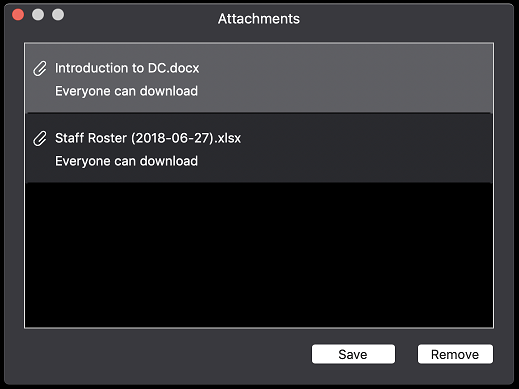 Download documents others have shared from the new Attachments dialog box. You can now send and receive chat messages when you join a meeting from outside of your organization or join a meeting as a guest. Reduce the size of the app installer from 47 MB to 35 MB. Prevent the Show chats with same person in a single pop-up window preference from being turned off when the app is restarted. Display the name of the person being called in the phone call notification when a call is forwarded to other people. Fixed an issue that could cause an IM message to be displayed multiple times. Fixed an issue that caused long IM messages to be garbled when displayed. Fixed an issue that caused your status to incorrectly change to Available while in a conference call. When in a conversation with someone using Teams, Skype for Business will help you start an ad hoc meeting so you can share your screen. When Show conversations in separate windows is enabled, all messages from a user or group of users will be displayed in the same top-level window when Show single window for conversations with same user is checked. Fixed an issue that prevented Skype meetings from having a dynamically generated meeting link and conference ID when the user chose Customize access levels, presenter options, and phone settings when scheduling the meeting in Outlook for Mac. Fixed an issue that sometimes caused the app to freeze when setting your location. 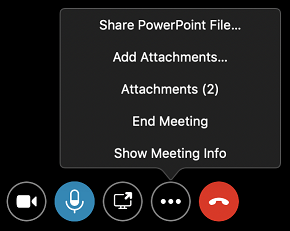 If a call or meeting disconnects because the network drops or changes, Skype for Business will automatically reconnect to the meeting when the network becomes available. When a user searches for a contact in the Chats or Contacts tab, Skype for Business now returns Exchange contacts as well as contacts from your organization’s address book. 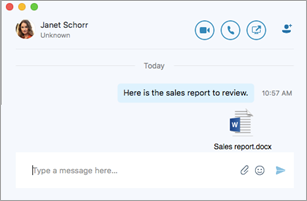 Emoji in Skype for Business are now animated and larger when sent by themselves. If you are not signed into Skype for Business on Mac when you click to join a meeting, you can choose whether to sign in or to join the meeting as a guest. Users can now use Skype for Business on Mac to join meetings even if they don’t have a Skype for Business account. Users who have upgraded to Teams will now see an option to sign in to Skype for Business to join a Skype for Business meeting or see past conversations. Users won't be able use Skype for Business to start calls or new conversations or to respond to conversations. Users can now choose to display the chats list in grouped or list view. On the Chats tab, select Grouped View to have all chats with the same contact or group of contacts displayed under a single collapsible heading. Fixed an issue that caused calls to drop even when network conditions were good. Fixed an issue when redialing a phone number with a headset attached that caused the call window to continue to show "Calling" after the call was established. Fixed an issue the prevented a user from starting a chat from the contact card in Outlook. Fixed an issue that prevented the user's status from being updated to "In a Meeting" during a scheduled meeting time. Fixed an issue that prevented the red dot to indicate unread messages in a chat from being displayed for chats with long names. 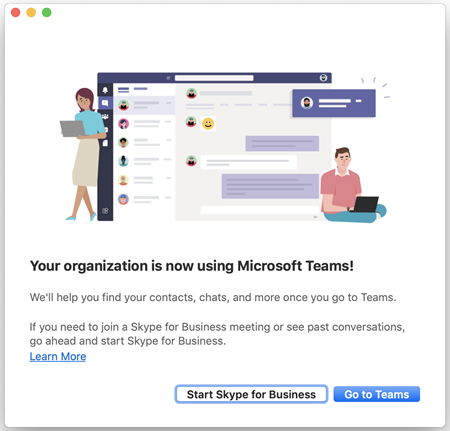 Improved the notification displayed to a user who has been upgraded from Skype for Business on Mac to Microsoft Teams. Skype for Business on Mac will display a notification when it detects conditions that can affect your audio and video quality such as long network delays, high CPU usage, or echo. If you are enabled by a conference policy to join audio by having the meeting call a phone number, you will now be able to choose Call me at in the Join Meeting Audio dialog box before joining a meeting. 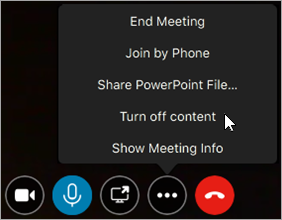 When you choose to join a meeting without joining audio, you will see the meeting window with a black background and a notification that you have joined the meeting without audio. If you want to connect audio later, select the Call button. Fixed several issues that could prevent you from joining a meeting. Added a Don't show this again for this device check box to the prompt to switch to an audio device when a user connects a device to the computer. Fixed an issue with displaying long IM disclaimer text. Fixed an issue where emoticons in chats were displayed when disabled by policy (via DisableEmoticons in CsClientPolicy). Fixed an issue that prevented users who are not enabled for Enterprise Voice from seeing the Before joining a meeting, ask me which audio device I want to use option in the Calls page of Preferences. All users now have the option to see chats in a single, tabbed window even if your organization has disabled automatic archiving of IM messages and server-side conversation history. Choose the size that someone's shared screen is displayed in your meeting or call by selecting Fit Content to Window or View Content Actual Size from More Options (…). When your organization has enabled server-side conversation history, Skype for Business on Mac will automatically accept IM conversations no matter how long you have been away from your computer so that you can see the messages when you return. Skype for Business on Mac will display a warning indicator on the app icon in the Dock when the app is signed out or not able to reach the Skype for Business server so users can easily tell when they are offline. When you click Join, connect to your meetings significantly faster and with fewer failures. When scheduling an online meeting in Outlook, use the defaults defined by your organization's policy for who gets directly into the meeting without waiting in the lobby and for who is a presenter. This requires Outlook version 16.9.116 or later. Support for location-based routing of phone calls Your administrator can control how calls to or from people outside of your organization are handled based on the location of the parties in the call. Display IM disclaimers Skype for Business on Mac will display a disclaimer message at the beginning of every IM conversation if your organization specifies them. Support for E-911 calls When known, the location of a 911 caller will be sent to the emergency service provider. For West Safety Services customers, this might also require installing Emergency Gateway Version 5.4. Send files in peer-to-peer chats Users can send and receive files while in a chat session by clicking the paper clip in the chat message input box. They can also drag files directly from the Finder to the chat message input box. Fixed an issue to block users from signing in from outside of their organization's network when disallowed by policy. Fixed an issue that prevented users from getting their meeting list when a mobility policy is disabled. Users can select the Devices button while in a meeting or call to select audio and video devices. 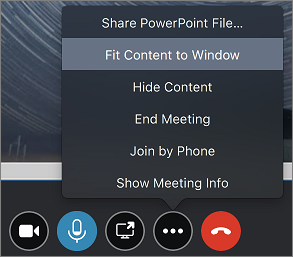 When users select a meeting on the Meetings tab, they can press the Join button to see the Join Meeting Audio dialog box to choose how to join audio. The option to have a meeting call to a phone number is now only available from the Join Meeting Audio dialog box. 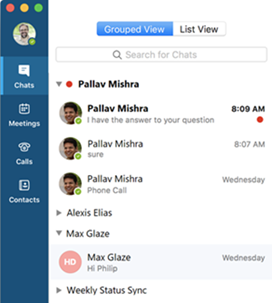 Users will now see screen sharing fill the meeting or conversation window so it is easier to see what is being shared. The app will automatically stop sharing the screen when a user hangs up to make sure others can't see the user's screen after they leave a meeting or call. The user can easily send an email to someone with information on how to join a meeting by clicking Invite by Email in the Meeting Information dialog box. Removed the requirement that a user be enabled for Enterprise Voice in order to see the Join Meeting Audio dialog box. Add ability for an administrator to customize the sign-in UI to show the User Name field in the sign-in dialog box as well as in Advanced Options. Click here for help with customization. 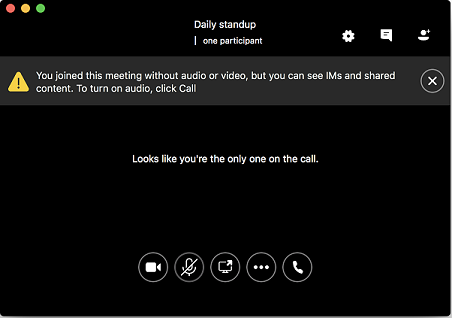 Users can choose to join meetings without joining audio. 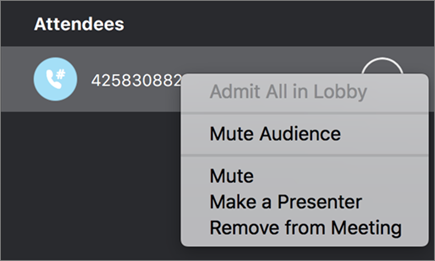 Users can choose the option for one meeting by selecting Don't join audio in the Join Meeting Audio dialog box or set the default for all meetings in the Calls page of Preferences. The Join Meeting Audio dialog box is displayed when you join a meeting from your calendar or by double-clicking an item on the Meetings tab. 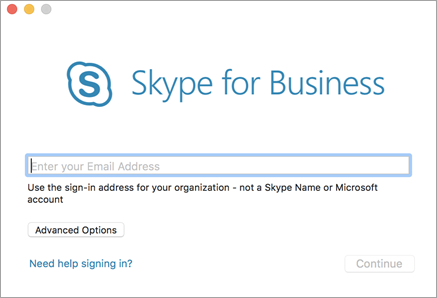 Signing into Skype for Business on Mac is now easier and only asks for information that is needed. The user starts by entering their email address, and Skype for Business determines what additional information is required by your organization. The user name field has been moved to the Advanced Options dialog box. Entering a user name is not necessary for most users, but might be required by some organizations. Users can now sign into Skype for Business on Mac using client certificate-based authentication when required by their organization. Users can choose to hide or show content that another user is sharing in a meeting. When someone is sharing their screen, select Hide Meeting Content from the More Options (…) menu. If content is available but not displayed (because it was hidden or due to an error), select Show Meeting Content from the More Options (…) menu. Users can now join meetings that are hosted by another organization even when external connectivity (federation) has not been established between the two organizations. To join these meetings, start from the meetings list on the Meetings tab. Joining these meetings from Outlook is not yet supported. Upgrade your macOS with confidence knowing that Skype for Business on Mac fully supports High Sierra. 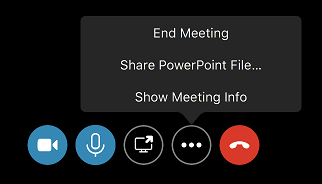 Users who are Presenters in a meeting can now end the meeting from Skype for Business on Mac by selecting More Options (...) and then End Meeting. When a meeting is ended, all users in the meeting are disconnected. 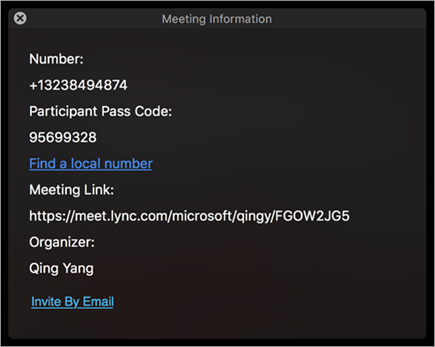 Users will now see the Join Meeting Audio dialog box when joining a meeting from the Meetings tab in addition to when they join a meeting from outside of Skype for Business on Mac. A new help link in the Calls page of Preferences dialog box will make it easier for users to access documentation describing how to add delegates in Skype for Business. Users can now search for contacts with whom they previously haven't talked to directly from the Chats tab. Users can see who have added them to their contacts list in Skype for Business from the New Contacts list in the Contacts tab. Enterprise Voice users can choose to have audio go to their phone when they join a meeting by selecting Join by Phone from the Meetings tab. Added a More Options (...) button in meetings. Enterprise Voice users can switch audio to their phone after joining a meeting by selecting Join by Phone. Users can share a PowerPoint presentation while in a meeting by selecting Share PowerPoint File. Users can see information about a meeting (such as the organizer’s name, meeting link, conference ID and call-in phone numbers) by selecting Show Meeting Info. Users can resume a held call by selecting Resume Call. 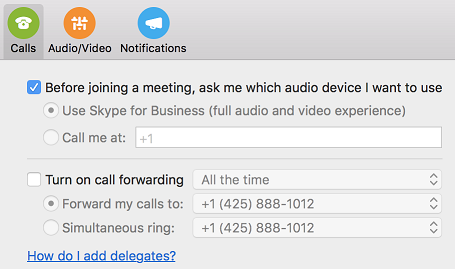 Users can now join meetings from another organization that is not federated with your organization directly from Skype for Business on Mac, rather than having to join in their browser. Simply select Join on the Meetings tab like you would for any online meeting. Users can now join a Microsoft Teams meeting directly from the Meetings tab in Skype for Business by selecting the meeting and pressing Join. When sharing their screen in a meeting, Skype for Business Online users will use video-based screen sharing with higher frame-rates and better quality. Note: Skype for Business Online users only. On-premises users can now schedule Skype for Business meetings in Outlook with their dedicated meeting space (which uses the same meeting ID for each meeting). 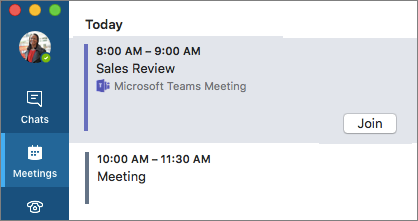 Meeting scheduling in Outlook will now use a pre-assigned meeting for on-premises users, if available. Note: Supported on Skype for Business Server 2015 and Skype for Business 2013 only. Added Touch Bar support for various functionality on the contact card (such as IM, phone, video, email, and schedule a meeting) and in meetings (meetings controls such as video, microphone, and share). Added support for Cloud PBX auto attendants and Cloud PBX call queues for Skype for Business Online users. Improved support for delegate management. Note: Supported for Skype for Business Server 6.0.9319.281 on-premises. Fixed a known issue with bidirectional file transfer for Skype for Business Online users. Note: Supported for Skype for Business Online users with Skype for Business Server 2015 Update version 1617.5. Fixed a memory issue with the 4th Generation MacBook Pro where the app would leak excessive amounts of memory after a video call or video-based screen sharing. Fixed an issue where the notification center would be filled with alerts about network problems. Fixed an issue where 00 was always normalized to + regardless of the user's region. Fixed an issue where the letters of vanity phone numbers wouldn't correctly translate to digits causing calls to fail. Fixed an issue with double dial-tone sounds while dialing a PSTN number. Fixed an issue that prompted users to update the meeting due to policy changes when scheduling public meetings. Fixed an issue where multiple participants sharing their desktop or program in a meeting were seeing a black screen. Fixed mute and unmute issues on peer-to-peer calls. Fixed various issues with sign-in, screen sharing issues, and crashes. For a complete list of known issues, see Known issues - Skype for Business on Mac. Peer-to-peer file transfer is enabled for Skype for Business Online. Users can now send and receive files while in a chat session by clicking the paper clip in the chat message input box. They can also drag files directly from the Finder to the chat message input box. When a user receives an incoming call, the video preview and the video button for answering the call show up on the incoming ring panel. A Skype for Business user who receives a call from a Delegate on behalf of a Delegator will now see the call is made on behalf of the Delegator. When a user saves the ring device settings, the selection is saved after the application restarts. Names in the Contacts list are sorted alphabetically by first name. Users are informed they have been rejected from joining a meeting when they try to join multiple times. Fixed the error message that is shown when a user tries to create a contact group that already exists. Note: Delegate/delegator features are currently available for Skype for Business Online customers only. More features to come. Users can add a separate audio setting for a "ringing" device. Users are prompted to switch to device when user plugs in USB device. Added "Groups" button to the Contact Card and detailed Contact views, so users can quickly add other users to their contact list. Users can call and send IMs to the DL and Groups via the Group Contact Card. Messages are now separated by date. Added support for option SIP URIs in chat window. Admins can set the email and user name with user profiles. Users will now occasionally be prompted to rate their call experience. Fixed a false warning about Conversation History availability when the computer resumes. Fixed an issue about users not receiving an error message when trying to sign in to Skype for Business on Mac on a network that uses network proxy server without configuring the HTTP proxy setting. Fixed various headset mute/unmute problems. Fixed issues related to muting and connectivity. Fixed issues with meetings created from Outlook and joining from Polycom and Skype Room Systems. Note: Existing meetings scheduled by Mac client on Skype Room Systems must be rescheduled for fixes to apply. Users will be prompted to sign in to Exchange for meeting and calendar updates, if they are not already signed in to Exchange. Improved screen sharing in 1:1 conversations. Improved ending a call — some users could not end call when in the lobby. Improvements to voice-over announcements and other accessibility improvements. Changed the position of the message "Your microphone is muted" and call controls. Implemented other UI improvements and bug fixes. For the complete list of known issues, see Known issues - Skype for Business on Mac. Users can now share their desktops during peer-to-peer IM conversations. Note:   Peer-to-peer desktop sharing from Skype for Business 2016 on Windows client for on-premises Skype for Business Server 2015 users requires February Updates for Skype for Business Server 2015. Peer-to-peer desktop sharing from Skype for Business 2016 on Windows client for on-premises Lync Server 2013 users is not supported. Log out of Skype for Business on Mac. Fixed bugs related to desktop sharing and conference calling. Improved UI and notifications in the client   . Fixed issue with users unable to transfer calls. Improved issues related to accessibility. The automatic presence update based on Outlook calendar feature is not currently supported. This will be addressed in a future update for Skype for Business on Mac. A Skype for Business on Mac user sometimes sees a blank screen when a Skype for Business on Windows user shares the desktop in an IM conversation (peer-to-peer or group IM). Workaround: The Skype for Business on Windows user shares the program or window, or the Skype for Business on Mac user restarts the Skype for Business on Mac app. 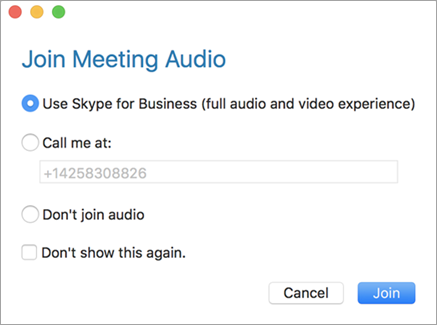 Skype Room Systems cannot join a meeting scheduled by Skype for Business on Mac. Workaround: Dial in to meeting or use Skype for Business on Windows client to schedule the meeting. See Known issues - Skype for Business on Mac. Fixed an issue for organizations that use a custom channel for the ChannelName preference in Microsoft AutoUpdate. Video-based screen sharing (VBSS) viewing is available for Office 365. VBSS is technology that allows for a more efficient way of sharing content over the network as compared to RDP. Learn more. Single window mode for Lync Server 2013 users. Skype for Business on Mac already offers a great experience to manage multiple conversations in a single window. Now that experience is extended to Mac clients that connect to Lync Server 2013, which was not supported prior to 16.2. In addition, if server-side conversation history was previously disabled, single window was not available either. This is now addressed unless your organization has disabled EnableAutoIMArchive explicitly. Also, messages can be auto-accepted if the Mac client is active, and IMs can be shown as missed messages. Will not depend on SSCH. It will only depend on EnableIMAutoArchiving. On when EnableIMAutoArchiving is enabled or not set. Off when EnableIMAutoArchiving is disabled. Skype for Business on Mac will always auto accept IM if it is most active endpoint. If SSCH is enabled, it will be accepted by the server. The conversation will persist in Exchange and display in the conversation list. If SSCH is disabled or not set (for example, in Lync Server 2013), the client will accept IM and display in the conversation window, but will not save it to the "Conversation History" folder in Exchange. Skype for Business on Mac will show the conversation locally and it will not roam. When user closes the conversation window or restarts the client, the conversation will reappear in the conversation list. If user does a clean installation of Skype for Business on Mac or logs on from another computer, there will be no history of previous conversation. When user closes the conversation window or restarts the client, the conversation will not be persisted or show up in the conversation list. In audio calls, you can now add desktop sharing. Note: Single window mode is already available for Office 365 and Skype for Business Server 2015 2015 users. However, if EnableIMAutoArchiving policy has been disabled by the admin, single window mode will not be available. Changed the default notification type to banners. Users can change their settings on the Notification Center (Skype for Business > Preferences > Notifications). User experience during meetings and calls. Client stability and other bug fixes. 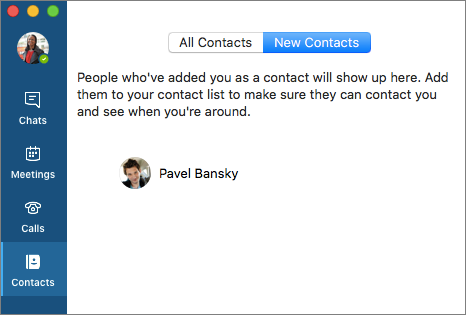 There is a known limitation with Mac search where it will not show federated contacts and Skype consumer contacts; it can only show contacts in the local Active Directory. While in a call, desktop viewing is currently not supported from Skype for Business 2016 on Windows on-premises users. Workaround: Users can join a conference call or using "Meet Now." 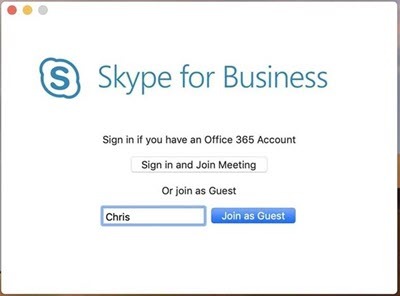 Note: Skype for Business on Mac client is compatible with Office 365, Skype for Business Server 2015, and Lync Server 2013. Customers using Lync Server 2010 should continue to use Lync for Mac 2011 as their Mac client. By default, if your topology meets the following requirements, all conversations will be shown in a single/tabbed window. However, there are cases when the client can’t detect if server-side conversation history is enabled and it will not default to single window view. This can be remedied by updating settings under Preferences. Preferences > General > Show conversation in separate windows is unchecked. This is a known issue and will be addressed in a future update of Skype for Business Server 2015. Workaround: Select any contact or group, and the menu will be re-enabled. Workaround: Click on the chevron to correct the icon. On the iOS app in the App Store page, in the What's New section, choose Version History to see a list of the updates for each release. On the Android app in the Play Store page, in the What's New section, see a description of the latest update.